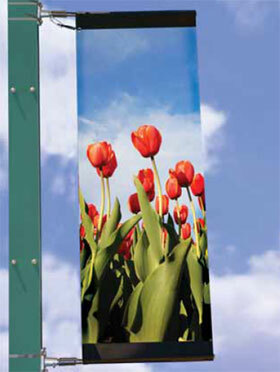 Exhibition flags are another popular exhibition system. They easily attract attention. Promotional flags have been used everywhere for as long as people have had a message to display. They are easy to erect and do not require much maintenance. Pyramid Visuals has a broad range of flags and other exhibition material which can be customised to suit your needs and your pocket. Such exhibition flags can be used both indoors and outdoors and are designed for maximum and exposure and for attratcing attention to your stand or exhibition display. 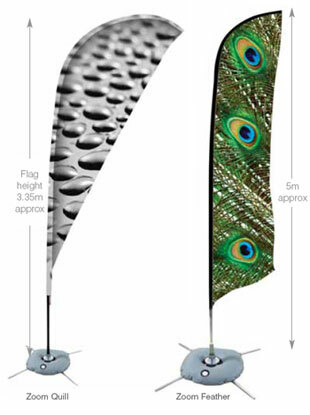 Exhibition flags are perfect foor displaying directions to various exhibits and stands ar tradeshows and exhibitions. In fact any outdoor event can benefit from a few well placed flags. Click on the image below to browse through our gallery of exhibition flags or give us a call if you have any questions. The Zoom is ideal for all types of indoor or outdoor displays and events and is available with a choice of bases to suit a variety of different surfaces. Mistral is a unit that will mount a graphic on both poles and solid walls. Its weatherproof construction makes it the perfect display for both outside and inside use.